Do you ever confuse similar words? You’re not alone! Here are some words that have different meanings but are often confused. Homophones are words that sound the same. Homographs are words that are spelled the same but have different meanings. They may or may not sound the same. Let’s not forget words that have different spellings and pronunciations and still get confused often. Effect and affect; heir and air; bear (to carry) and bear (the animal); bureau, burrow, and burro (bureau is slightly different though), lean (not fat), and lean (to tilt onto something), Polish (from Poland) and polish (A shiny coating) .. I could go on, don't you love English!? One thing I find interesting is that under the "homophones" section, you had "our" and "hour" together. I know some people who pronounce them the same way, but I would say "our" and "are" are homophones. I'd say all three are homophones. ...and someone who resembles the ever-present character from the Irish course would presumably be Pólish. Most people I know pronounce Polish as poe-lish and polish as pawl-ish. That's true, but they do still have the same spelling. :D Yeah. It makes me wonder about the etymology of the noun polish. Just a question... so, do you speak all of those languages beside your name? I see pause and paws but how about pores? Or without the s - paw, pore, poor and pour ? In dialects that pronounce “moor” and “more” differently, “poor” is distinct from “pore” and “pour” (and “paw” in non-rhotic dialects). In a more East Coast US, and perhaps some UK dialects, they all sound about the same, but where I'm from in the Midwest only pause and paws sound the same. In Spanish, verb endings change to describe who is doing the action and when. For example, I eat is yo como and you eat is tú comes. Because of this, you can just say como arroz (I eat rice) instead of yo como arroz. "our" and "hour" are pronounced the same "are" is more like a pirate. "arrr". Where I come from most people pronounce fair and fur the same. Near Liverpool. Also hair and her sound the same. Her being pronounced the most reconisable way. Ah that makes sense. I'm from the Midwest US. Here her is just like hr or hir and hair is again with a hard A. These all just depend on one's accent then I would suppose. Your examples are not all homophones because they are not pronounced the same way. Bureau, burrow, and burro are all pronounced differently, with three different "u" sounds, by native English speakers (regardless of the regional or national accent in play). The same for effect and affect: effect is either pronounced eee-fect or eh-fect, while affect is pronounce a-fect. Same for Polish and polish - the first has a long "o" while the second has a short "o". Also, "hour" and "our" are true homophones while "our" and "are" definitely are not. I'm just clarifying this so that those trying to learn English do not learn incorrect pronunciations. Your hearing of the pronunciations of these words serves to underscore why it is so difficult to learn a foreign language. Our ears, and mouths, are very attuned to the sounds of our native languages, and we often don't hear the nuances of pronunciation in a language that uses slightly different sounds. Were I to try to identify homophones in German, no doubt I would err in the same way. As for "Polish" and "polish", I believe those are more correctly termed homographs rather than homophones. I don't say "hour" and "our" the same way, but I live in New Zealand where we greatly confuse many of the "a" and "o" vowel sounds (relative to other English dialects). I think we probably say "hour" the same as most dialects do; but my "our" is nearly a homophone to "are"! I find there were a handful of homophones on the list I don't pronounce the same, berry & bury are the most obvious to me I pronounce bury like brrr -y like the sound that you make to announce that you're cold. J'ai lu que tu es francophone car j'ai pensé d'écrire quelque chose en français aussi. :) L'anglais n'est pas ma langue maternelle non plus parce que je suis polonais :). Je sais que l'anglais n'est pas une langue facile mais je vois que tu l'as maîtrisé déjà ! :) Pardonne-moi si j'ai fait des erreurs en français mais je n'ai pas eu beaucoup de pratique récemment :). Merci! j'espère que ma anglais est bien, j'ai appliqué au université en anglais. Je pense que maintenant ma anglais est plus bien que ma français. Même que c'est ma langue matérnal, j'étudié anglais formellement mais j'ai jamais etudies français formalment autre de école élémentaire. Ton français est trés bien. That's awesome! I'm sure you'll do great! :) I'm majoring in English and I'm actually thinking of PhD studies focusing on Canadian English :). Je te comprends :). Parfois, j'oublie des mots dans ma langue maternelle et je me souviens des mots anglais ;D. Merci beaucoup ! Ça veut dire beaucoup pour moi ! I'm from Canada but I'm Francophone and learned English mostly from a bunch of different sources so I have a hodgepodge accent. Mine (as in mineshaft) and mine (as in "that thing is mine"). To further clear up this issue, below are examples of "you" in plural and singular in Spanish and in English. "you" (pl.) - You (all) should do better next time. "you" (sing.) - You should do better next time. 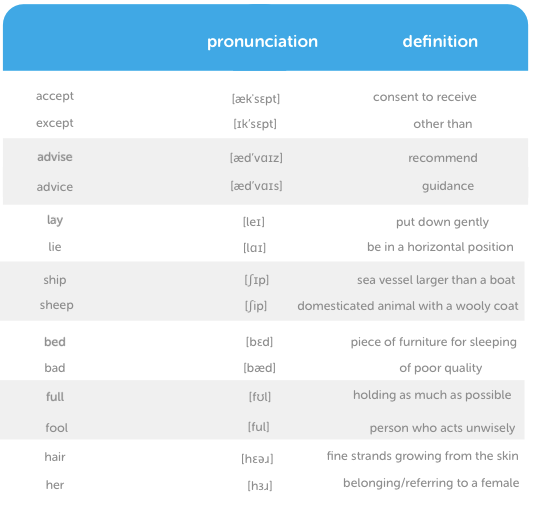 Some homophones are pronounced differently in various English dialects, and, as indicated in other comments, have additional words pronounced the same way in other dialects. Nice list. I used to keep a booklet of homophones. 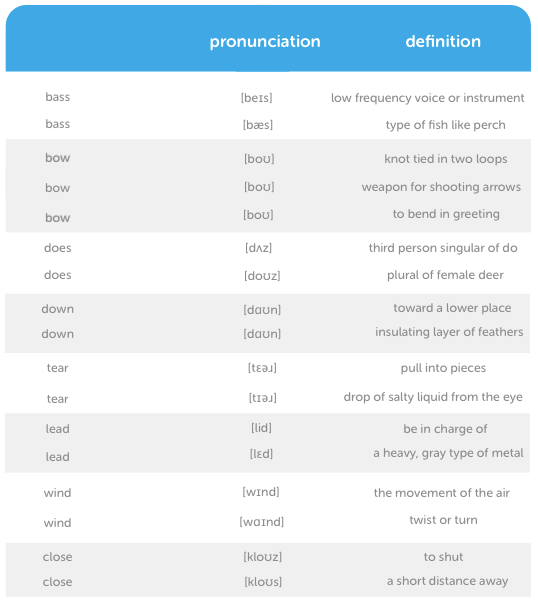 Your last "bow" should be pronounced differently. Also, consider adding "bough" to the list. You could also consider adding to that list another definition of "bow," the end of a ship, pronounced like the "bow," as in greeting, and the above mentioned "bough." I'm not sure weather I approve of homophones. Eye yam knot shore weather ewe a prove uh vim, aye there. It's a sign of how screwy English is that I understood that perfectly. I'm not sure whether I can weather your weather? In your list of homophones, “yore” could be added to “your”. (I pronounce “you’re” as /jʊɹ/, so “you’re” and “your” are homophones for me only when “your” is unstressed.) 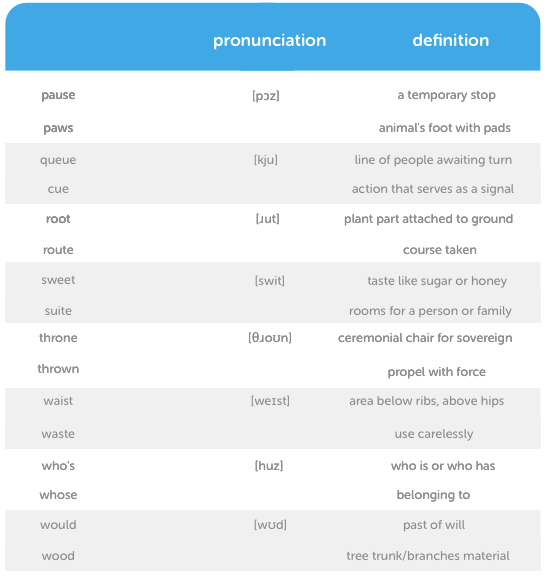 “You”, “yew”, and “ewe” could also be added, as could “be” and “bee”, “key” and “quay”, “pea” and “pee”, “see” and “sea”, “tea” and “tee”, “yea” and “yay”, “hay” and “hey”, “high” and “hi”, “low” and “lo”, “hew” and “hue”, “coo” and “coup”, “no” and “know”, “toe” and “tow”, “time” and “thyme”, “red” and “read” (past tense), “led” and “lead” (the element), “bridal” and “bridle”, as well as “new”, “knew” and “gnu”, “so”, “sew”, and “sow” (verb), “lay”, “ley”, and “lei”, “nay”, “neigh”, and “née”, and “rain”, “rein”, and “reign”. Another possibility is “for” and “fore”, with “four” added for those dialects in which “horse” and “hoarse” are homophones, and “oar”, “ore”, and “o’er”, with “or” added for “horse”–“hoarse” merger dialects, as well as pairs such as “pain” and “pane”, “days” and “daze”, “maid” and “made”, “mail” and “male”, etc. which are homophones in most (but not all) dialects. In your list of homographs, “read” (/ɹiːd/, present tense) and “read” (/ɹɛd/, past tense) could be added, as well as “mine” (possessive pronoun) and “mine” (source of ore), “pine” (tree) and “pine” (long for), “round” (adjective: circular) and “round” (competition stage), “rime” (icy coating) and “rime” (second part of a syllable), and “export” (/ˈɛks.pɔɹt/, noun in rhotic dialects with the “horse”–“hoarse” merger), “export” (/ɪksˈpɔɹt/, verb in rhotic dialects with the “horse”–“hoarse” merger), “export” (/ˈɛks.poɹt/, noun in rhotic dialects without the “horse”–“hoarse” merger), “export” (/ɪksˈpoɹt/, verb in rhotic dialects without the “horse”–“hoarse” merger), “export” (/ˈɛks.pɔːt/, noun in non-rhotic dialects with the “horse”–“hoarse” merger), “export” (/ɪksˈpɔːt/, verb in non-rhotic dialects with the “horse”–“hoarse” merger), “export” (/ˈɛks.poət/, noun in non-rhotic dialects without the “horse”–“hoarse” merger), and “export” (/ɪksˈpoət/, verb in non-rhotic dialects without the “horse”–“hoarse” merger) — one pair of homographs with four pairs of dialectal pronunciations! In your list of confused words, “rein” (a strap connected to a bridle) and “reign” (to rule as a monarch) should be added, so that people will recognize that giving someone “free rein” rather than “free reign” preserves the riding metaphor. 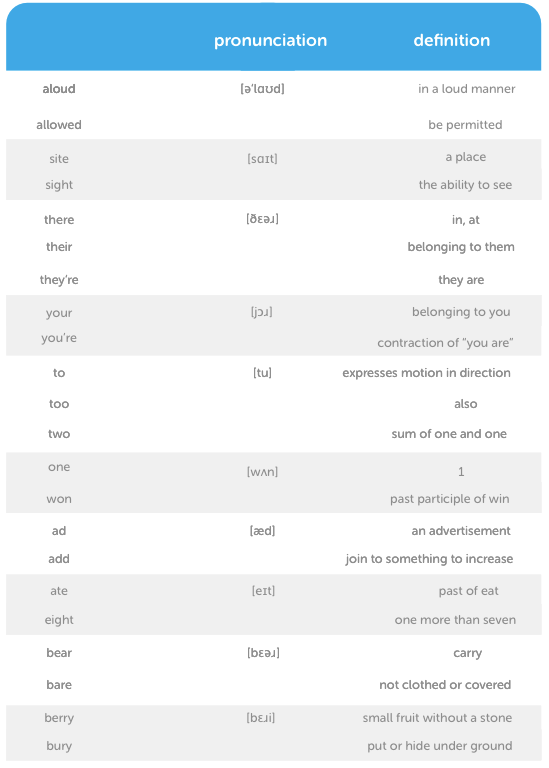 Similarly, “you’re” and “your” could be added to the list so that “you’re welcome” (vs. “I’m welcome”) can be distinguished from “your welcome” (vs. “my welcome”), and “have” and “of” could also be added, so that perfect infinitive constructions like “I should have known” (and “I should’ve known”) can be recognized as correct, and “I should of known” can be recognized as incorrect. LOL! i am confused i mean like really confused now!LOL! There is Diner and Dinner, Desert and Dessert. I know people always mix those up! wander and wonder are two americans seem to get confused a lot. What Americans are you hanging out with?! I lıved there for ten years so I came into contact wıth a faır few. I've lived here much longer than that and I don't know anyone who mixes those up. maybe you have been wondering about without noticing! I am surprised you didn't include "cite" with "sight" and "site." Here's a good one: "To bait", meaning to put a worm on a hook so you can catch a fish, vs. "to bate", meaning to cause to lessen or cease. That second verb really isn't used much, mainly as an adjective participle in the phrase, "To wait with bated breath". I have lost count of how many times I have seen someone write that he is "waiting with baited breath"; makes me want to ask him if he's been eating worms. 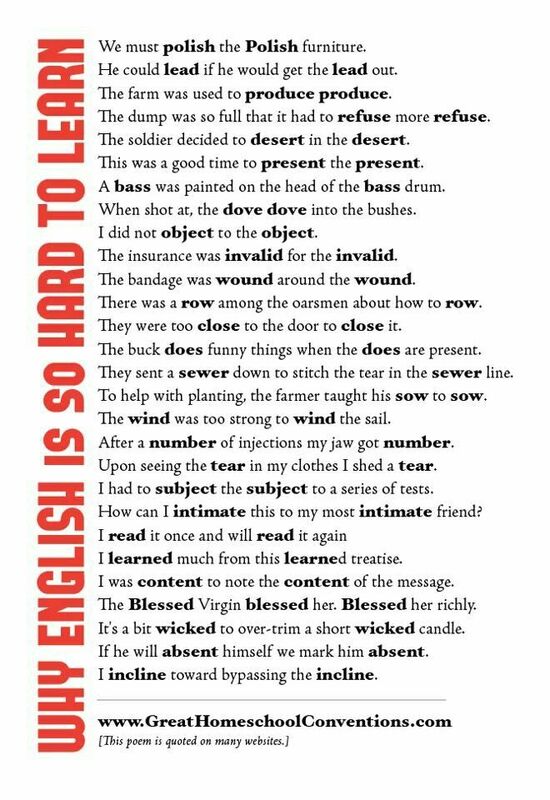 English is crazy. Makes me wonder why it's the linga franca of the world. Being an island floating off the coast of Europe, it was basically a given that Britain would become obsessed with maritime exploration. Since the sea is a road that connects everywhere to everywhere else, and since we were the strongest naval power for a long time, trade took us all over the world and military power only sealed the deal. Couple that with generally cultivating superior technology compared to nearly everyone, even the oldest civilisations like China, and there was very little standing in the way. Other European countries played the same game, but Britain also had the advantage of being naturally well protected from outside intervention. We have a big moat of the coast of Kent which generally kept out trouble makers. There is a fascinating parallel with Polynesian languages, hundreds of years before the British Empire was even a faraway dream, Polynesian languages spread over an area further and wider than any continent, in a giant triangle stretching from off the coast of Africa, east through Indonesia and the Phillipines, north to Hawa'i and down to the Pacific off the Peruvian coastline, and right back through New Zealand. It may not be a strict fair comparison because it is not one people with one language, but it gives you ample evidence of how easily a people and culture can spread across a vast distance just by using the sea. All those closely related languages were spread by people using little more than rafts, who navigated by the stars pretty much from memory using techniques that would baffle anyone alive today. In contrast, Brits had sturdy wooden ships, professionally trained sailors, compasses, clocks, sea charts, star charts, not to mention guns to discourage people from bothering us... we basically had it easy. I just love the Aussies and Brits!! Funnily enough, it was a rhetorical question. But, thanks for the reply. When Normans lost Normandy, started switching to English language of land they ruled. But English had hardly been written for over 200 years; all official text had been written in French and anything related to universities or clergy was in Latin. So scribes tried to write down what they heard and were pretty inconsistent. They applied French spelling conventions to English words, so cwen became queen, cirice became church and c was used instead of s in words like cell and circle. They also struggled with English handwriting, where u, v, n and m all looked very similar. So they replaced u with o in words like done and come. At same time, thousands of French and Latin words were entering English language. scribes kept original French spelling for some (table, double, centre) but changed spelling of others to reflect their English pronunciation (e.g. beef, battle, government, mountain). This was wild time for English spelling as concept of “correct” spelling didn’t really exist. People also spelled according to their local dialect.. 500 years ago, 5-7m people spoke English, almost all of them living in British Isles. Now, anywhere up to 1.8b people around world speak English. EN doesn’t have Academy to say how language should develop. Scholars tried to make English neater language but ended up making it messier! How did this happen? Growth of English has nothing to do with structure of language, or any inherent qualities, and everything to do with politics. It's the most convoluted language. That's why there's movement for simplified or Globish that the British have to learn as well. "When the Normans lost Normandy..." Huh?? They are still there. I think President Thomas Jefferson posted something about the unreliability of internet information while he was writing the Magna Carta. In today's Digital Age, Internet is Magna Carta Libertatum. You should know how to Analyse Data to make it meaningful. And read from different sources/languages to avoid bias. When (copied) from English it is unreliable. Focus on the outcome related to EN not Normandy. 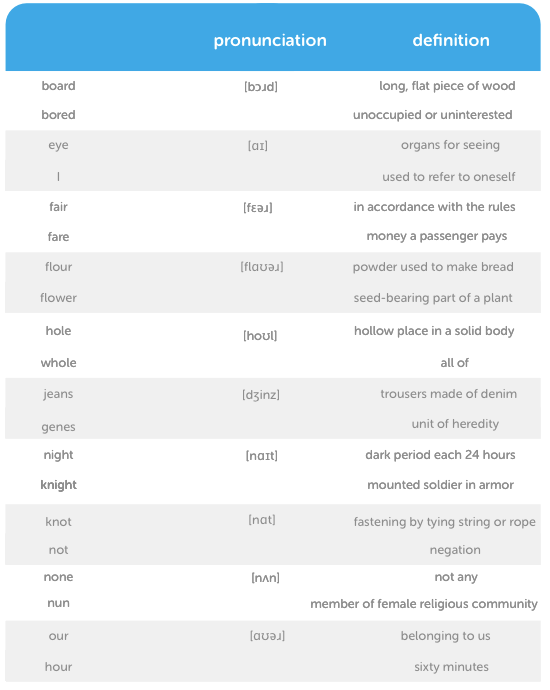 Just trying to find the logic of compound nouns (which can be verbs/adverbs/adjectives...crazy) and translate 'coffee bean bag'. Is it a (shopping) Bag (object) made from coffee bean? Don't worry about trying to find the logic in English, there is very little, it is a highly illogical language because it arose from so many diverse and conflicting sources. A coffee bean bag for example would usually be a bag in which coffee was stored and transported but in fact, it could actually, rarely be a bag made of coffee beans (if that's possible). Only the context would tell you. "The warehouse held large supplies of coffee bean bags in readiness for the harvest." "The shopping bag manufacturer bought large quantities of coffee beans for use in the production of their unusual coffee bean bag." Finally, the top of the sticky list is actually language related. This is second not the top. It seems silly to me. Most people pass those by anyway. Yes, this is a nice guide. I usually get homonyms and homophones confused. Just a question: Is the pronunciation of fool correct? Are you sure it isn't empty? "It's" is a contraction of "it is." "Its" is a possessive pronoun. It's raining. The dog can fetch its ball. One set of homophones I can think of are "passed" (to leave behind) and "past" (gone by in time or no longer existing). I've been speaking English all my life and I still mess up my homophones when writing! In dialects which preserve the distinct pronunciations of “cot” and “caught”, they’re not homonyms; in those dialects, “ball” is pronounced /bɑ(ː)l/, but “bawl” is pronounced /bɔl/. I'm sorry but I don't agree with this one. Most of my accent is very BBC English and cot and caught are definitely different for me but I can't hear a difference between ball and bawl. I don't understand why your pronunciation of caught has any standing with how you would say bawl. In dialects without the merger, the vowel of “ball” and the vowel of “cot” tend to be identical (/ɑ/ or /ɒ/, depending upon dialect), and the vowel of “bawl” and the vowel of “caught” tend to be identical (/ɔ/). Do you use /ɔ/ for “ball”? I have to agree with alibob99 on this one: check on any dictionary and you will always find "ball" having the /ɔː/ vowel of ‹caught›; maybe in some dialects ‹ball› and ‹bawl› are still distinct because of retention of an old difference but it certainly has nothing to do with the cot–caught merger. Under "sight" and "site" you should add "cite." How is that for insight? Root and route are not homophones for everyone. In fact, I rarely hear this pronunciation for route in the U.S. West. But to be fair, you don't get your kicks on Rowt 66. Great point. Route 66 runs through my city, and everyone does call it "Root 66" just like in the song. But when we are talking about pathways, most people say "rout." In fact, just days before I made my comment, someone told me to take a certain "root" and it caught me off guard. It's quite fascinating, the ways we use language. I pronounce them differently here on the East coast as well, but hear people pronounce them the same. These would always be homophones for a British English speaker. Do you pronounce route like rout? Yes, that is how it is pronounced in many parts of the U.S. Does anyone have a list of common Spanish words (en Español) that are homonyms and homophones? They are certainly homophones for me - may I ask where you are from? So where have you heard berry and bury pronounced differently? In the western US, at least, berry and bury are perfect homophones. Here too (UK). They are pronounced differently in different dialects, but I don't know of any dialect that distinguishes between them. Merriam-Webster (which I assume limits its phonetic transcriptions to General American) has an alternate pronunciation of "bury" with the u being a schwa that it does not list for "berry." Not sure of the prevalence or geographic distribution of such a pronunciation, though. Bad "und" Bett "sind nicht Homophone in den meisten Dialekten -" schlecht "ist typisch / bæd / und" Bett "ist typisch / bɛːd /. Ähnlich ist der Kontrast zwischen "bat" und "bet" typischerweise / bæt / vs. / bɛt /. That link just demonstrates different regional pronunciations of the same word: how do you derive a comparison of the pronunciation of different words (in a given regional accent) from that? so you think that those 2 people pronounce the word berry also like bury and not like berry? Different regional accents sound different! It is only a homophone if the same accent pronounces two words the same; it is not if the same person pronounces them differently. I don't pronounce ad or add the same way as an American does - that does not mean that ad add are not homophones (because both the American and I pronounce both words of the pair the same way, we just don't pronounce the pairs the same way as each other). Yes they are. Bury is pronounced BARE-ee And obviously berry is BARE-ee as well. In the UK they are. USA Mid-Atlantic: the words are pronounced the same, much to the amusement of people in neighboring dialect areas. Imply vs. infer; comprise vs. composed of. Not homophones in any way, but they are often confused. However, it is correct to say, "The beach comprises sand, seashells, and water." The verb "to comprise" essentially means "to contain". So it might make sense to say that some things are comprised by something else -- e.g. "Sand, seashells, and water are comprised by the beach" -- but no one ever uses it that way. So I'd have to agree that, in actual usage, it's never correct to say "A is comprised of B, C, etc." But this usage is becoming so common that, at some point, Chomsky will win and it will become "right" simply by dint of overwhelming force of popular usage. I dont. But here are some Desert (DES-ERT) like ice cream, and a sandy desert. Not quite. The verb "to desert" means "to abandon", and is pronounced the same as a tasty post-meal dessert, like mousse (not to be confused with moose, which is much heavier and not as sweet). Hey guys listen i'm a little confused about this topic help me out here! Although they have a variety of meanings has anyone tackled the various pronunciations of "-ough(t)? It was one of the toughest lessons to teach non-native speakers. Cough (coff), tough (tuff), though (thō), etc. I know native Spanish speakers I taught had difficulty in distinguishing between YELLOW and JELL-O. LOL at "yellow-jello" confusion. Yes, I can see that might be a problem, but it never occurred to me. This would all be so much better if we English speakers hadn't dropped "thou" from common usage. All this singular/plural nonsense would go away! In the homophones, some people pronounce our like "are" & route like "rowt". Overall these are just some examples of how flawed English' spelling system is. A native US English speaker West coast, I pronounce those that way. A Puerto Rican girlfriend, native to the island, mixes these up all the time. Don't let her say Ford Focus. Most of these are however near homophones that (depending on the learner's native phonetic and phonemic inventory) would sound the same in their accent. For example most romance and Slavic languages (basically languages that do not have length distinction) do not have any phonemic distinction similar to the slip–sleep one, so they confuse the two phonemes; the same can be said for the fool–full pair, which is actually homophonic in some native English accents (the cockney accent, for example, or the American accents with the full-fool merger). Many languages, including German, tend to produce a more "American" /æ/, conflating it with the /ɛ/ phoneme, thus bad and bed sound the same. The [ɜ] in her is also a rare phone cross-linguistically and many languages with no central vowel tend to realise it as either a front rounded vowel (this is the case for most native German speakers pronouncing ‹her› like /hœ/, ‹hö›) or a front unrounded vowel, thus merging it with ‹hair›. I wouldn't say it's flawed; English has just had so many influences from other languages that there's no longer many set spelling rules. I have another one, similar to advise/advice. Devise: Invent, Conceive ---> I would like to devise a new phone. Device: Gadget, Machine ---> I like this new phone, it is such a great device. It's worth noting that in American English, "berry/bury" and "root/route" are not homophones. Those are homophones in British English as far as I'm concerned. I also think that some dialects of English do have different sounds for "your/you're" and "their/there/they're". You should probably clarify what dialect of English we're going by in cases like these. “Berry” and “bury” are homophones (as /ˈbɛ.ɹi/) in US English, and there are dialects of US English in which “root” and “route” are homophones (as /ɹuːt/). You could also include bat and bet, I know someone who can confuse all four. “Bad” and “bed” are not homophones in most dialects — “bad” is typically /bæd/ and “bed” is typically /bɛːd/. Similarly the contrast between “bat” and “bet” is typically /bæt/ vs. /bɛt/. They also weren't listed as homophones. Then why did you list them in your first comment above? I suspect that that is because bad–bed–bat–bet are all homophones in a thick German accent (realised approximately /bɛt/), so it may be useful to point out that in most if not all standard English accents they are differentiated. Bad "und" Bett "sind nicht Homophone in den meisten Dialekten -" schlecht "ist typisch / bæd / und" Bett "ist typisch / bɛːd /. So if you eat like a famous American crooner from the 1950s, then you would say, "Como cómo Como." Hour and our are pronounced "are" and "our"
Only in some dialects. Which dialect of English do you speak? Remember, there are homophones and homonyms. Homophones are two or more words that sound the same, but have different meanings. Homonyms are two words that are spelled the same. Therefore, "poll" and "pole" are homophones, and "lean" and "lean" are homonyms (although technically homonyms are homophones in that they usually sound the same, I think they are still grouped seperately). Homographs are words that are spelled the same. The term "homonym" is used to mean homophone, homograph, or sometimes both. Don't forget cite and sight or sent, scent, and cent. Also, to me fur is more like grrrr and hair is identical to hare. It is so frustrating that I cannot reply to other comments; each time I try, my comment somehow moves far away from the comment I am trying to reply to. Even typing at the top of the page sends my comment to some random space in the comment section. Is there a way to fix this? Typing at the top will send you to the bottom of the list and your comment starts with 0, so any negative comments will be underneath yours. You must click on reply at the comment you are replying to. Doesn't this work for you? If you see this below your comment, it did. Oh, huh... I guess it worked. This did not happen earlier when I tried to reply to sbeecroft? I don't know why it wouldn't. I am glad it is working for you now. I didn't check all of the comments but dove can be pronounced differently depending on whether you are referring to the bird or the past tense of dive. Also, whether and weather, now that I mention it...and also I/eye, 1st person pronoun/sight organ. Yes, those are homographs which are spelled the same but pronounced differently. English learners could confuse the pronunciation. I wouldn't pronounce weather and weather the same, as Whether starts with an aspirated sound. Similarly I distinguish whales and Wales, what and watt (a unit of power). But weather and wether (a castrated male sheep over the age of one) are definitely homophones. I've been wondering about this: how many people do you think know the word "wether" - I didn't until recently. Google looks for "weather" at first. The spell checker in Chrome doesn't know the word. It's similar to the Danish word for "ram" (vædder). The two words share etymology. You are right of course about the pronunciation of whether - is this true for all english speakers? It's often the case that general speakers of a language, even native speakers, don't know specialized vocabulary. "Wether" is a specialized term. If most people of an area were sheep farmers, the term would be widely understood. I knew about wethers because relatives raised sheep in Wales - my aunt once said, apropos of the meat on my plate, that there was 'one on the hill and one in the freezer'. I did some research which suggested the term hogget is more common, though the meaning is not quite the same. A hogget or hoggett is a male sheep between one and two years old, it may or may not be castrated, whereas a wether is a castrated male sheep of any age but usually older than two. Boy am I glad English is my first language. This would have confused the hell out of me. Hey - Used to attract attention, to express surprise, interest, or annoyance, or to elicit agreement. and Hay - grass that has been mown and dried for use as fodder. Buoy and boy are homophones. Unfortunately, buoy is often mispronounced. Practice & practise. The first one is a noun, second one is a verb. Examples: I am doing some practice on my violin; I spent an hour practising my violin. Easy way to remember which is which: substitute the word "advice" or "advise"
In the US, "practice" is a verb. "Practise" is not used at all, and is considered a misspelling (unless found as a verb in British-produced works). I noticed most of the German clubs form codes on here are full, so I started a new ione. Learning German from English - Feel free to join! I noticed most of the German clubs form codes on here are full, so I started a new one. Learning German from English - Feel free to join! Tea (caffeinated drink) and Tee (the little thing used for golf). Little one I thought of really quick. "Eat-eight"? "Ate-eight", yes, but not "eat-eight". what about rain and reign? Thank you guys so much this is what makes this site amazing working hard to help others! I'm very sorry to add this comment. I feel terrible, honestly, but for French class I need a whopping 270 lingots to get an A grade by next week. I know many are going to just downvote this comment, I understand... but just one donated lingot would really help out. Thanks! You know, there are ways to get as many lingots as you want that don't involve asking anyone else for them. Instead, you do lessons and achieve levels. That sort of thing. You might want to consider earning your 270 lingots in this, the old-fashioned way. What do the numbers next to the languages mean? NOTE: As a long-time teacher of English as a Second Language (ESL) this was a treasured possession, back in the days of hard-copy only. After I lost my copy, the internet proved that it ain't all bad by hosting the poem in multiple places. Enjoy! Is it common for Slavs to learn each other's languages?